I am at my niece's wedding but thought I would share some really cute pictures of my cute boy and my daughter's cute 9 month old Newfoundland. Okay, disclosure. 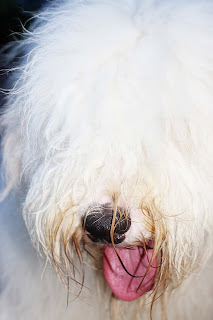 I have had Old English Sheepdogs for 20 or more years. 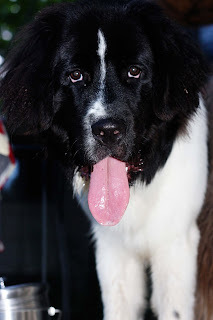 So it was funny when my daughter introduced a Newfoundland into the mix. 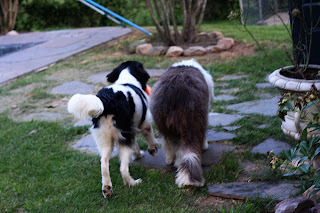 He, Mr. Darcy, does not understand how to play sheepdog. And my boy, Chaucer, does not know how to play Newfoundland. They play like cousins. Remember when you visited your cousins and you did not know how to play their games and they did not know how to play your games. These boys have figured out how to play but it was awkward and funny to watch. However, there is one thing they have in common.... they like to hang out their tongues.!!!! I bet it was cute watching them get acquainted. We just got a new Italian Greyhound puppy and it's so cute to see him cuddle up with our other IG. They are both adoreable. Makes me want a dog but my cats would object and be mean to them. How cute these cousins are! Pretty soon they'll be sneaking out in car and stuff that cousins do together. Yesterday we visited our local Petsmart, and a man had the biggest black Newfoundland and the biggest Burmese Mountain dog EVER. They took up the whole store!!!!!! But, man were they beautiful! 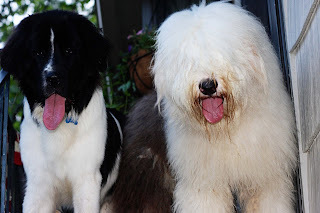 I totally love your sheepdog, he is so darn cute! Hello Mr. Darcy. You adorable, sweetie! I love love love big dogs. Real Dogs. They are both so cute. Glad they get along.